Bright colours, modern, organic forms, and innovatively reshaped open plan space is just a few of the components if you are in the league to meet the high criteria of the Best of Year (BoY) judging committee. Run for a decade by Interior Design Magazine the BoY 2015 marked its 10th year anniversary, honouring the best projects and products within the interior design sector. 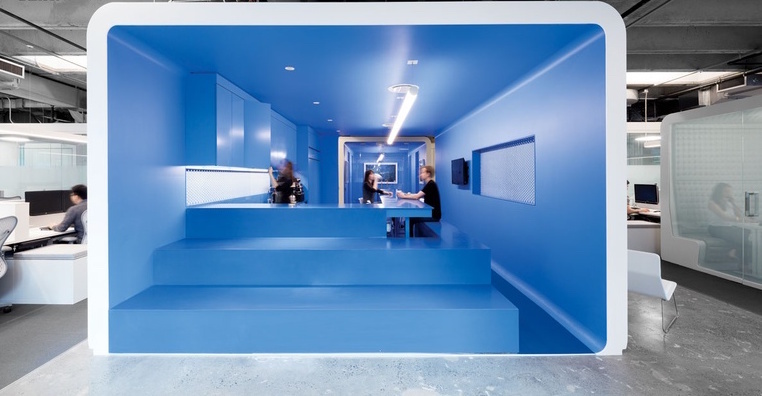 The category for Media and Tech Office of the year always brings together some of the most innovative workplace designs. Creative and extremely functional, these offices combine research and technology to offer a truly inspiring, stimulating and vibrant environment for the employees and the business. Combining all necessary specifications and criteria, the BoY Winner for Media and Tech Office of 2015 was awarded to IHeartMedia – the agglomeration of radio stations and billboards. Its current CEO – Robert Pittman, previously known for bringing success to leading brands such as MTV Networks and Century 21 Real Estate, took the office redesign project in his hands and turned its revamp into an award winning interior design. The IHeartMedia artistic office used to be a plain, uninspiring satellite office in New York. A major expansion and redecoration were very much in need in order to move the headquarters there from San Antonio. Pittman was quick to secure two additional levels in the same glass building, bringing the total office space to 75,000 square footage. For the more creative part of the project, he employed renown art and design consultant Michael Beneville, who took into his team Brad Zizmor and Dag Folger. The brief of the redesign instructed to strip everything from the old office and keep the setting raw. This was balanced with polished, round pods in different colours and with various functions. A truly impressive and unique feature is the entrance of the office welcoming visitors into an interactive tunnel before reaching reception. The tunnel is equipped with sensors, which react to every step, turning the white LED to red as well as triggering hidden speakers to start playing successive IHeartRadio stations. A real masterpiece of contemporary design!